This afternoon Jane and I visited one of my “new” choices for lunch. And yes, it could easily become a "new favorite". It is also one to log into the memory for the next time one of the family is admitted to OSU hospital and we need a lunch run. Spinelli’s Deli is located in the Thurber Center in Victorian Village next to the Giant Eagle. The Restaurant Week menu was pretty generic: the first course was either a small soup or ½ a salad; second course was choice of sandwich, pasta or pizza; and the third course was a choice of brownie, cookie, or cupcake and a fountain drink. Nothing there to reach out and grab me … that is, until I looked at their menu items. Then I was “wowwed”! I needed time to study this before I went, there were so many choices! This would be one reason why I just love a good deli. The menu is so full of promise. I walked into Spinelli’s knowing just what I wanted, because I had done my homework! I placed my order and Jane placed hers. We took our tray and went out to sit in the sunshine and enjoy our feast. Both Jane and I got the ½ salad as our first course. And we both chose the CranTurkey Cobb Salad. This was delicious! 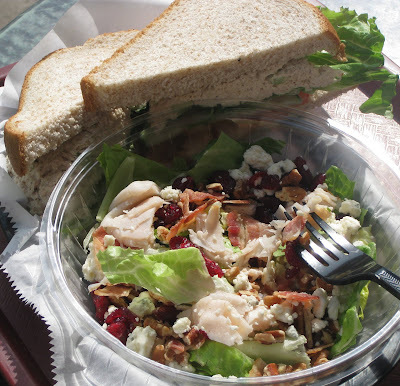 It had romaine lettuce, roasted turkey, smoked bacon, dried cranberries, crumbled blue cheese and poppyseed dressing. The lettuce was fresh and crisp. The turkey and cranberries were plentiful. The blue cheese was just right; not too much and not too little. The poppyseed dressing was perfect and was served on the side. Any fan of “When Harry Met Sally” will tell you that it’s very important to have it served on the side. And as for the bacon, well what isn’t better when bacon is added? This salad will be a definite “do-over”. My Reuben was just wonderful. I have so been craving a Reuben and this did not disappoint. The rye bread was perfectly grilled. The corned beef was also grilled, giving it a nice depth of flavor. Sauerkraut, Swiss cheese and Thousand Island dressing finished off the sandwich. This was one choice I was totally happy with. We both finished up our lunch with the chocolate raspberry cupcake. What a treat! First of all, it was pretty. 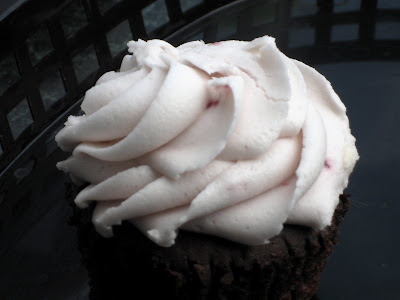 The icing was a pale pink and you could see bits of raspberry in the swirls of piping. The cake was so moist and so delicious. It was just the perfect ending to a decidedly yummy lunch. What a good choice! Spinelli’s, we will be back! The buckeye/peanut butter cupcakes were to die for- a luscious lump of peanut butter filling in the middle was just. I had the lobster bisque and the turkey artichoke pannini with my combo- the soup was good and buttery and the pannini really fabulous.